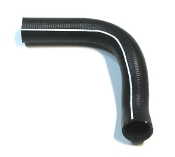 Rubber lower radiator hose with white stripe and sharp printed part number,etc. This is the correct hose for February 1970 to July 1970 builded cars. For 1970 AMC AMX / Javelin V-8 models.